This article is about the Mario Party 4 minigame. For the Mario Party 6 minigame of a similar name, see Money Belt. Money Belts is a 1-vs-3 coin-collecting minigame in Mario Party 4. It is the only coin-collecting minigame in the game to not feature the music "Full of Vigor"; instead, its music is "Try Hard, Folks". 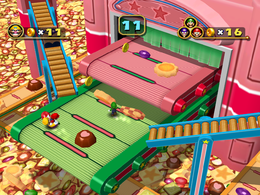 The camera shows two conveyor belts with boxes containing the solo player on top, and the three other players on the bottom. The boxes wiggle, and the camera changes angle as the players jump out of the boxes. The game begins. The lone player starts out on a small conveyor belt, while the team starts on a larger conveyor belt beneath it. The conveyor belts will start moving and coins and candy will start coming out. Players must collect the coins and Coin Bags. The candy blocks their path, possibly causing them to fall off the conveyor belt. If that happens, players must wait until their character returns via a box. At the end of thirty seconds, players keep whatever coins they collect. All objects on the conveyor belts disappear as the players line up on their respective territories as the camera changes angle to the front. The players will do their winning poses, but if no coins were collected at all, the players will sulk in disappointment. Game Rules – "This is a coin-collecting bonus game. Avoid the cookies and sweets on the belt and grab as many coins as possible." Advice – "Sweets come off the conveyor belts on the left and right, too, so watch out, and be careful!" German Geld am laufenden Band! Money on the Running Belt! This page was last edited on December 16, 2018, at 10:03.